See what mischief and mayhem comes to DragonFable.com's Frostval THIS year, and get more news and previews in the DF Design Notes! As the battles heat up in this week's new game releases, our new rewards will thrill and chill you! Artix Entertainment's holiday releases continue this week with more quests to complete, bosses to slay, and gear to unlock! Queen of Monsters: The Poison Spreads! Brightoak has succumbed to Nevanna’s poison and now the heart of the World Tree itself is under attack. Race to reach the center of the Grove before she uses the Horn of Protection to summon something even more earth-shaking! Find Quibble Coinbiter's 2015 Frostval Rares shop in Battleon! This weekend, travel to the village of Frostvale to investigate a mystery that, if unsolved, will leave you cold as ice! Solve the mystery of an ancient relic after Chilly summons you! This week, EpicDuel players will witness the exciting relaunch of the extremely popular Gifting system! We will also be updating the Legendary shops and seasonal shops with some awesome new gear! Log in for over 60 new items including weapons, home items, styles, and armors! We are over 80% of the way to reaching our Kickstarter goal... just a short way to go and 20 days to get there! We've added a new $10 USD package that comes with in-game items in AdventureQuest Worlds, AdventureQuest, and DragonFable! BioBeasts Coming to a Mobile Device Near You... VERY SOON! BioBeasts is nearly ready to launch! Find out what you can do RIGHT NOW to help us spread the word and make the official launch an EPIC one! Do you feel like fondue, Hero? Prepare for one of this year's cheesiest releases from San Robin, coming soon from the DragonFable team! It's got muensters of a whole new brie-d... and puns aplenty! The holidays are here at Artix Entertainment, and now's the time to break out the SLAY bells and wreck the halls for rockin' rewards! Return to Frostvale and take on the Bibliospectre! A peaceful afternoon reading holiday stories? Not for the moglins of Frostvale! When Twig opens a cursed storybook, an ancient evil is unleashed, and it’s up to YOU to stop it! Find all the returning seasonal rare Frostval gear in shops throughout Frostvale! Be on the lookout for Kibbles, and his cousin Tibbles, as they spread holiday and monetary cheer amongst your fellow players! The top 15 donators for Kibbles and Tibbles will receive a special weapon set! Don’t miss our Scavenger Hunt happening on the AQ area of the Battleon Forums! 3 winners will receive a custom title in-game! Guardians of the Cyclone Dragon... ASSEMBLE! Unlock the Cyclone Guardian Dragon Armor for FREE! when you become a Guardian in December! Plus: Log in and play AQ 20 out of the 31 days in December you will receive 2000 FREE Z-TOKENS! Joules has teamed up with an old enemy to try and one up her brother’s past… disappointing Thankstaking take overs. You’ve plowed through the ancient leftovers, are you ready to try a real food fight challenge? New items are being added to the 10th Anniversary Shop! It’s the last week for the Black Friday Shops! Make sure to check out all the new and all the classic items! The Frostval Storybook is coming! 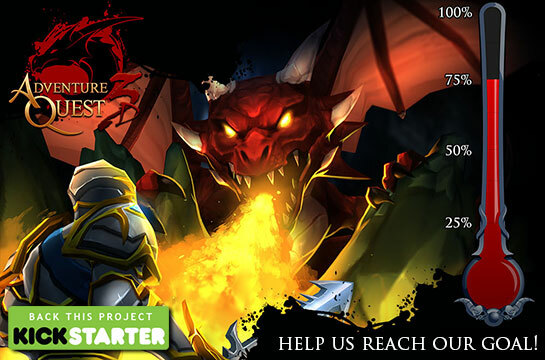 Help us reach our AQ3D Kickstarter Goal ! We are over 60% of the way to reaching our Kickstarter goal... just a short way to go and 28 days to get there! Check out the wicked rewards you'll unlock when you back the project on the site, or run around the game and see what we've already built! FREE Dage Sword, Just for Sharing! We are all over the place right now! The Kickstarter campaign for AdventureQuest 3D is in full swing ($90,000 and still going up!) and we have submitted AQ3D to Steam Greenlight for approval. We're doing great, but a project like this always needs to seen by more people. So, we had a thought... why not give you guys something just for helping us spread the word? This is your AQ3D Kickstater Backer Quest: Share our AQ3D Kickstarter announcement post on Facebook and retweet Artix's AQ3D Kickstarter announcement tweet! If the community completes the quest, everyone in AQW, DF and AQ Classic will get a FREE SWORD designed by Dage. The higher the score, the bigger and crazier the weapon gets! See how many we can get before the Kickstarter ends on the first day of the new year! SHARE THIS: Facebook AQ3D Kickstarter Post. 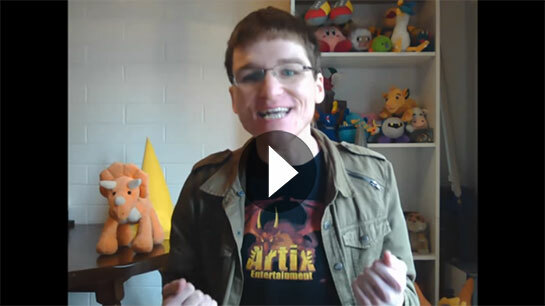 RE-TWEET THIS: Artix's AQ3D Kickstarter Tweet. That's all there is too it. The Blade unlocks at 1000 TOTAL shares and re-tweets. (example: 500 shares + 500 re-tweets = 1000 total), and it evolves the more we share these two posts! This is great because you get something for doing almost nothing AND you're helping us spread the word about the AQ3D Kickstarter! Thanks for helping and thanks for sharing! Help us finish AdventureQuest 3D! Over the past 11 months, we’ve created a 3D online version of AdventureQuest that you can play on your phone, tablet, and PC. Support this project on Kickstarter to help get this game to the finish line! As November draws to a close, darkness sets in and a chill fills the air. But the heat of battle will keep you warm this weekend as you take on the challenges in this week's all-new game releases! The Queen of Monsters Saga Continues in Elfhame! General Nevanna's corruption is spreading, and the heart of the World Tree is beginning to rot… This weekend, battle through the ruins of Elfhame - the massive skeleton of ancient beast - to recover the key to restoring the world tree! Battle through the Ruins of Elfhame to discover where the Horn is hidden! Solve the puzzle to unlock the Guardian's chamber! Don't miss the 13th Doom Lord AdventureCoin package, now available! The crooked merchant underestimated the resolve of Lolosia’s citizens... now YOU can battle through the completely-rebuilt Lolosia! The final 2 items have been uncovered inside the pyramid - The Scarab Shield and Eye of Osiris Misc! In the highlands of Dwarfhold live the AlpOrly? people. They use large horns to send simple messages over great distances, and sometimes as weapons. The Ice Katana! Forged by Yulgar, and given magical might by Warlic! How strange: this one smells like vanilla? The siege around Falconreach has been broken and your dragon has spotted the captured soldiers! Gear up and head into the fog shrouded woods to try and rescue your friends! The Dark Night boss fight! If you win the Bone Shard weapons could be yours! Your very own War-Torn Clan Valtrith mask! Even though it's still 90 degrees at the lab, this Friday we will be returning all of our Winter content to EpicDuel. 2016 Calendar Now Available for Pre-Order on HeroMart! The 2016 Calendar is now available from Heromart! Each month features hand-drawn character art from your favorite Artix Entertainment games! Tomorrow is Friday the 13th, Heroes, and you know what that means... WAR! Hope your luck holds and you head into battle, Heores, because this weekend's releases will be ones you'll want to remember... if you survive! Voltaire's 13th Friday the 13th: 13th Lords of DOOM! As the 13th 13th draws near...the shadows are growing restless. Work with Voltaire and Deady to gather the fragments of the Cursed Mirror of Enutrof to stop the Mysterious Stranger's 13 Lords of Doom and dispel the shadows that are attacking Lore! Find all new Friday the 13th Event Rares in your game menu right away! NEW Friday the 13th Event Rares! DOOM is here and so are all-new Friday the 13th event items! Defy superstition and unlock awesome souvenir items in our limited time rare gear shop… only available until November 30th! There's a crooked merchant making his way through Lolosia, selling maps to a vast treasure! The only issue? Everyone in town bought one! User your powers of persuasion (... your sword arm!) to keep them from tearing each other apart! Battle your way through the treasure seekers until YOU find the reward! F13 - The Dark Night! Shadows are rising in the woods by the Bay as Jaysun’s forces gather to lay siege to Falconreach and Oaklore. Are you ready to fight beside The Rose to break the siege? Or will your animosity help provide Caitiff with more bodies to try and bring further Doom to Lore? Fight to break the siege and save the towns! Don't miss any of this weekend's new game releases, because as the season turns and the nights grow colder, the battles in our games are only going to get even hotter! Channel the power, strength, and speed of the forest as you race to find Rivensylth the Faerie Dragon in Brightoak Grove! The knowledge she holds may be the key to defeating General Nevanna… IF you can trust what she the trickster dragon says! Choose one of 3 paths and quest lines as you hunt for Rivensylth! Learn about the mage who would become one of the Queen's fiercest Generals... and your worst enemies! The Queen of Monsters Saga continues THIS Friday! NEW 12 Month Membership Bonus Gear! Unlock the exclusive Swordhaven Royalty gear and all the rest of our member perks when you purchase a 12 month membership, then head in-game and battle to earn King Alteon's armor! Unlock the armor, 3 helms, cape, sword, and character page badge! Just when you thought you had fully explored the pyramid, rumors are swirling about another set of items in Ammon’s keep! Find new, permanent masks available for purchase at Warlic's Shop for a limited time. Soul Drink Vampire Blade is now available in the Limited Time Shop! The Cook at the guardian tower needs you to get some rations! But where does he usually gets his ingredients? DragonFable's Mogloween event is still available, too! Last week, an unspeakable evil was unleashed and now it’s up to you and Bubble to put it to rest! Don't miss your reward if you succeed - new helms to match the PumpkinLord armors! They came. They carved. They squashed the competition. Wow! What a talented bunch of pumpkin-slaying Heroes we have! Here’s a great big THANK YOU to everyone who participated to this year’s Pumpkin Carving Contest. Congratulations, Proximitykitty725! Your Cauldron Sisters pumpkin has won the grand prize of 2000 AdventureCoins! Woohoo! It is our honor to award 8 of our fellow heroes with 700 ACs, each! Thanks for your pumpkin submissions! Here’s 500 ACs as a consolation prize to all our runner ups. On behalf of the entire AQW team, we would like to thank everyone who participated in the 2015 Pumpkin Carving Contest. You guys and gals really know how to squash the…uh, well… squash! Whether your entry was chosen this time or not, we are honored that you participated, and look forward to seeing your submissions in our future contests (hmm, maybe Frostval Cookie Decorating Contest in December? ).